Harvie Passage- A Challenge For Drift Boat Use. Harvie Passage Low Water Channel (LWC) was developed as a safe passage through the Western Irrigation District (WID) weir in the heart of the City of Calgary, adjacent to Pearce Estate Park. The original development was completed in 2012, but unfortunately the 2013 flood destroyed most of the infrastructure. There was weakness in the original development, whereby safe passage through the weir was problematic. The redevelopment of the site addressed these concerns with a clear directive to make the Low Water Channel safer for all river recreational use. Although the objective was safe through passage, there was a secondary objective to develop the site into a Whitewater Park. The Government of Alberta (GOA) was comfortable that both objectives could be met. It was unfortunate that the interests of the fishing community and specifically the use of drift boats were not considered in the early stakeholder consultation process. 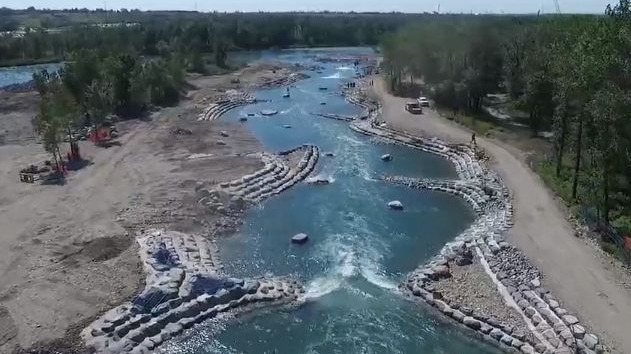 Bow River Trout Foundation (BRT) engagement with the consulting engineers on the Harvie Passage Project did not take place until 2016, therefore there was little time to make concessions to the design of the LWC to meet the specific needs for drift boat passage. BRT concerns are centered on the width of each drop chute throughout the LWC. A drift boat with oars extended is 6.50 meters in width and would have difficulty navigating each LWC drop. Although changes could not be built into the design to meet additional width, it was felt that navigation through the LWC would be possible provided there was a straight run at each drop and no rocks to avoid on entry and exit from each LWC chute. This concept was tested in July 2017 where a low-profile drift boat skiff navigated the LWC with little difficulty. Access to Harvie Passage was limited to hand launch activities until August 29, 2018 when a temporary public boat ramp was opened at Shouldice Park that made trailered-boat use of the upper city reach of the Bow River possible. This new access gives an additional 22 Km of river to float and fish from a drift boat, including the traverse of Harvie Passage by access to the LWC. Unfortunately, several enhancements to the design of the LWC following the 2017 test days have created potential hazards. The following photos of LWC Drop 4 illustrate modifications that changed the stream flow to the left of the channel. It is now difficult for a drift boat with oars extended to navigate Drop 4 and change direction between the two rock deflections on the left side of the channel. There have been incidents where drift boats have hit these rocks, that suggest changes in the design may be needed. Alberta Environment & Parks is aware of these concerns and will monitor the situation next year. In the meantime it is advisable to scout out the Low Water Channel before taking a trip. A float through Harvie Passage Low Water Channel is only possible when the Western Irrigation District water sluice-gates are closed from April to early October. It is hoped that this can be extended until the end of October. Drift boat use of the HP Portage Channel above the weir is difficult under low flow conditions. It’s too shallow, not wide enough and has very little flow. It needs to be dredged. Harvie Passage has been a very popular destination water park this year with unexpected use by body and tube floaters. This will only increase next summer constituting even more caution by paddlers and drift boats.